Our 3 “storm ” weekend, though not so stormy for all parts of the UK, finishes with the arrival of “Midge” in the S and SE on Sunday evening (we named our weekend storms Mary, Mungo and Midge… for ease of reference and for fun). Midge will deepen as he scoots across the southern half of the UK overnight as contrasting air masses meet. A plunge of NW cool polar air meets a remarkably warm humid plume of tropical air from the SW. This time RAIN is the key feature and potentially more than 30 mm could fall in some places, which is a large amount to fall overnight in one storm in the SE. Totals more like 10-25mm overnight will be widespread and this is sufficient for local flooding on already wet ground. If 30mm falls over a wide area expect significant flooding. 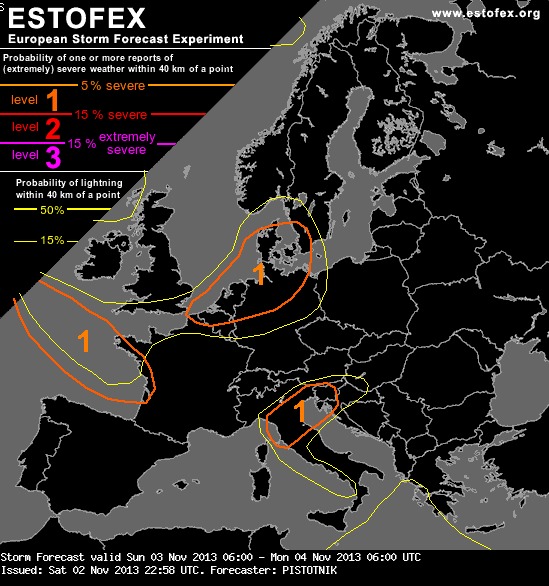 While UKMO maintain their weather warning for heavy rain during this period, ESTOFEX, European storm forecasting experiment, have downgraded a warning of extreme gusts for SE as follows: “The surface cold front itself will move leisurely southward over Southern England and the channel region. It may be associated with a shallow and weakly electrified convective line, but (convectively enhanced) severe wind gusts are not expected any more, as the wind field relaxes quickly on the cold side of the frontal zone.” So very gusty winds are unlikely for us but poss 30mph gusts during the night will make it seem pretty vile in the rain. Modeled predictions have slightly over-egged the previous two storms this weekend (and Mary was a complete miss! ), especially here in the SE, so we can rather unscientifically notch down maximum rainfall figures with some confidence to get a realistic figure for widespread rainfall. The GFS model has been accurate in track and arrival times of events but rather added value to the wind speeds and rainfall totals we finally got here in the SE. The NAE model seems to have performed better on rainfall totals. 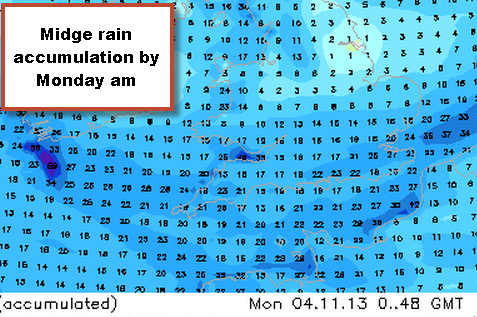 Going with this one then, we can predict rainfall figures for this storm event from 10-25mm widely across the SE. UKMO has issued a weather warning for the South of the UK including our area in Surrey. After a bright breezy day with a few light scattered showers around Reigate, expect more purposeful rain to arrive anytime around 18:00hrs and to become heavy through to the small hours. For a time overnight there could be thunderstorms embedded in the heaviest rain, but mostly restricted to the south coast. There will also be a period of higher winds, possibly gusting 30mph in Reigate around midnight. The rain may take a while to clear thereafter but should be clearing by morning rush hour. 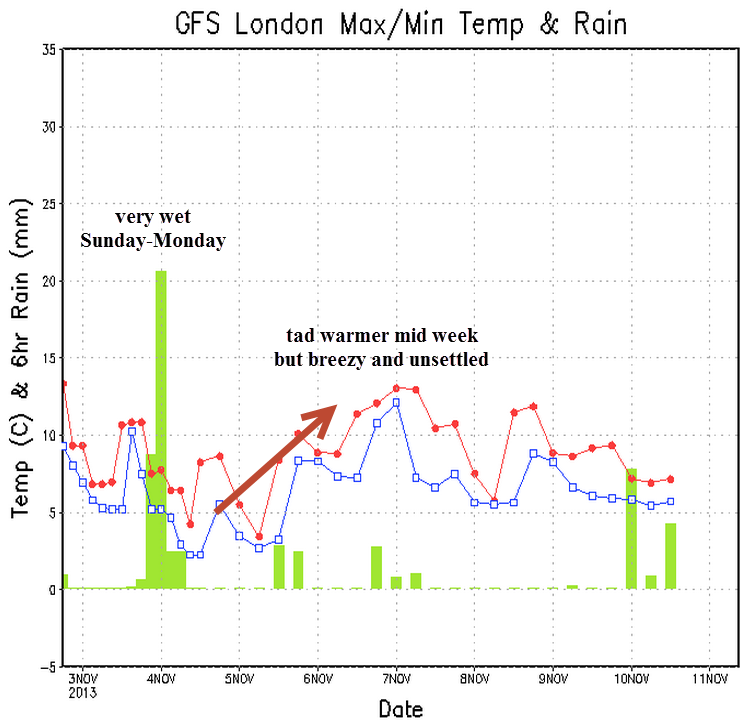 The lower temperature on Monday will be noticeable, as you will have put the cat out on Sunday night in temps of 12-13c and could easily wake up on Monday to temps only reaching around 5c. Thereafter, Monday’s Tmax will be 9c in the cool polar winds from the north. Things warm up after Monday back to the seasonal norm. We named the three UK “storms” this weekend Mary, Mungo and Midge. It’s interesting to note how different all three are in their characteristics. All have be driven by the jetstream. The jetstream remains very active across the UK all week with a brisk westerly flow but slightly fewer organised storms are expected.